The job description of a real estate agent has been turned on its head with the acceleration of internet usage. My experience as an agent prior to internet popularity writes a very different story to my experience today in an internet driven world. If you have not been in the market as either a buyer, seller or agent within the last number of years then you too might be in for a surprise if you expect the process to be the same. What follows is very much a personal experience of then versus now and therefore not to be taken as rule of thumb for every corner of the industry, past or present. Once upon a time… I sold real estate through the recent boom years of the early 2000s in a busy resort town of the upper north island. There were six real estate companies in the town. I could sell any company’s listings and be paid just as much as I would be paid to sell my own company’s listings. Not yet internet reliant, buyers relied heavily on agents to find them properties. Buyers also relied heavily on property signage, on print media, and on the existence of real estate offices as a place to browse listings on the wall-galleries. My designated gallery duty hours at the office were golden because many random buyers were likely to come to my sphere at these times. Many, many hours were spent with buyers in my car — only very rarely did we meet customers at a property. Because I could sell every listing in town I actively learned every listing available. I made it my business to be first past the post in quoting any of the entire six companies’ new listings relevant to the customers on my growing database. Usually, if I had been first to quote then they would come to me to view, no matter which company the listing was with. Much of my job description was centred around matching buyers to property. Today… much buyer inquiry is generally acknowledged to come from the internet. Buyers do their preliminary research online, looking at many photos and a more thorough property description than print media can usually provide. Even if a buyer spies a property in print form they know that a more comprehensive source of listings can be found on the internet. If buyers are not internet savvy then friends and family will often be there to help. The new heavy reliance on the internet means that buyers are less reliant on print, on signage, and less interested in walking into a real estate office gallery. 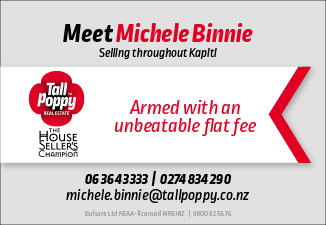 Conjunctional sales between companies rarely happen in Kapiti because agents are seldom paid enough to make worthwhile the effort of selling a competitor company’s listing. Buyers are therefore less inclined to engage an agent to help them look for property because each agent is limited to selling their own company’s listings and a buyer would need an agent in each office to cover the marketplace. But the main reason buyers no longer rely on agents is because all the available listings can be self-sourced at the click of the mouse. In my experience the internet has changed the way we buy and sell real estate no matter which side of the industry coin we are on: buyer, seller or agent. As an agent, before the internet gained such prominence my job description relied on a constantly renewable source of buyers, and buyers relied on me to match them to properties. But my own experience as a buyer coming to Kapiti three years ago was that I selected properties from the internet, chose for myself those that I considered a potential match, then directly contacted the agent assigned to those specific listings, made an inspection appointment, and that was that. Buyers no longer need agents to find them properties. As a seller I would no longer expect an agent to rely on a database of buyers but instead to largely work with the buyers that present directly through advertisng. Thus now that the internet has such prominence, the job description of an agent emphasises acquiring the listings because the buyers will then find those listings online for themselves.